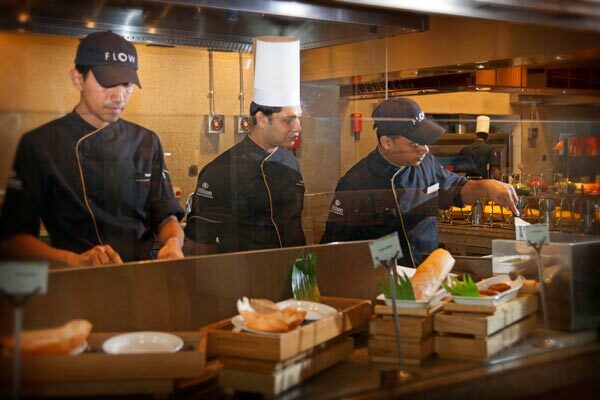 The multi-cuisine restaurant ‘Flow’ at the Hilton Colombo Residences. ‘Flow’ is an all-day dining, with an open kitchen concept that is a first of its kind in Sri Lanka, with seating for 168 guests. Experience cuisine from around the globe at this All-Day Dining. 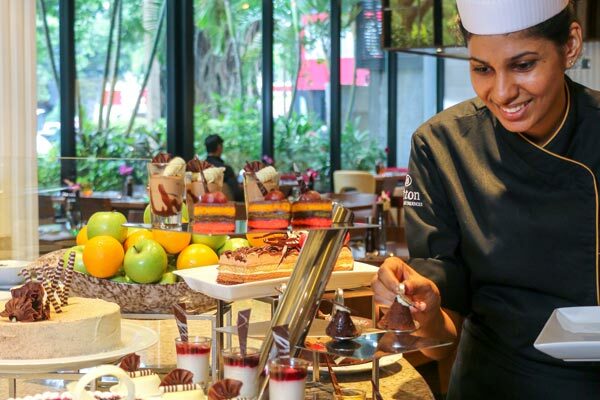 Watch your meals being prepared by our chefs in the five open kitchens in this sleek Colombo restaurant, a first in Sri Lanka.With 168 seats, FLOW offers buffet for breakfast, lunch, and dinner. The three private dining rooms are perfect for hosting intimate parties, corporate dinner meetings, or even working lunches. Host memorable dining experiences with curated menus at Sri Lanka’s only Chef’s table at FLOW. Open daily from 6:30 AM until 10:00 AM, open until 10:30 AM on Saturday, Sunday and any public holiday. Rs 2300 nett per person. Open from Monday to Friday, from 12 noon until 2:30 PM with an executive buffet lunch and the option of A La Carte. Rs 2950 nett per person. Open from Monday to Friday, from 7:00 PM until 10:30 PM with buffet dinner and the option of A La Carte. Rs 3350 nett per person. Launched in 2015, FLOW has paved itself as a destination for dining for entertaining corporate clients or hosting memorable occasions for family, the restaurant can offer seating in the main area or provide secluded areas in the three private dining rooms, one of which serves as a Chef’s Table. The restaurant is headed by Executive Sous Chef Premila Fernando and his award-winning team. 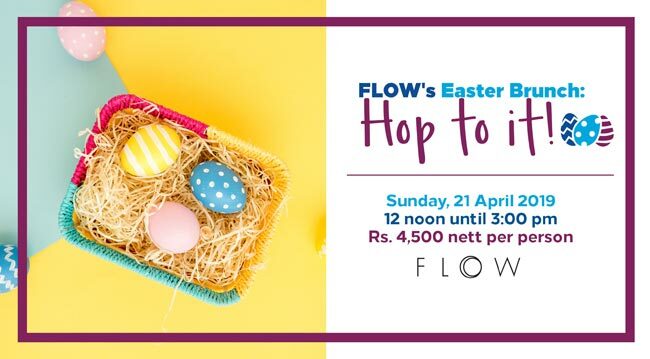 FLOW is located on the Ground Floor of Hilton Colombo Residences, Union Place, Colombo 02. A wonderful restaurant where the food is exquisite and the service is second to none. We had the great pleasure of dining here for our breakfasts and one dinner over 5 days in Colombo. 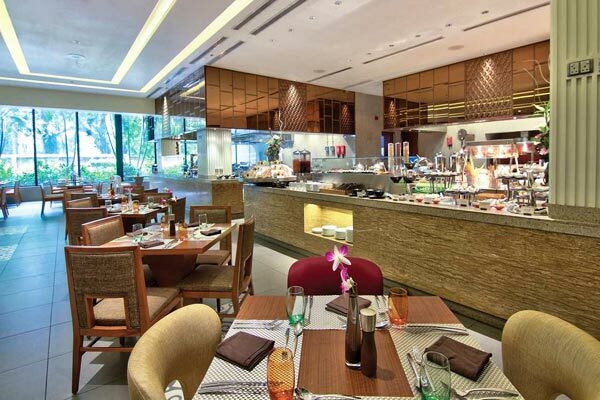 Attached to the Hilton Residences, the buffets offer a great range of local Sri Lankan cuisine and food choices from other nations. 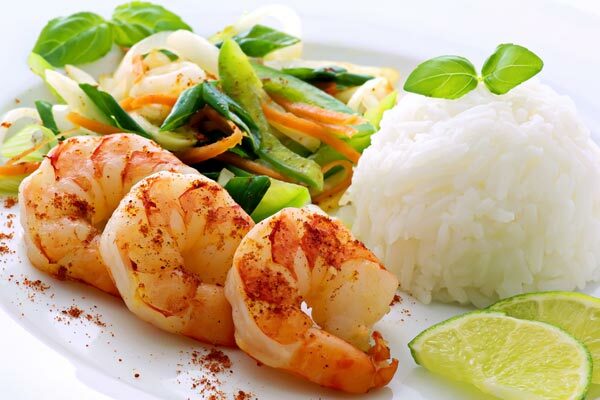 If there for dinner, try out the Inc Cream Kotta which is custom made for you. Great service from Malinda Gajanayake and Michael Meaden, both very skilled waiters who are very conversant and interesting to talk with. A great asset to the restaurant. We had this amazing breakfast buffet included with our room at the Hilton Colombo Residences for the past 4 mornings. The food was spectacular and abundant, but what makes this restaurant stand out from any other hotel restaurant was the staff. Just incredible! They could not be more welcoming and wanting to ensure that we had everything we wanted. We can not express enough gratitude to Kanishka (who even surprised us with ticket seating to an event and had a breakfast box prepared for us because we were going to miss breakfast one morning! ), Malinda (a trainee who will go very far in his career because of his never ending desire to help everyone! ), Thusitha (who brought us special tea and anything else we wanted! ), Rohan ( who taught my wife how to eat Sri Lankan foods), and every member of the Flow team. Thank you for making our Colombo trip so special. This is a place you can see live kitchen concept. You can get five differnt varieties. Sri Lankan, Mongolian, chinese, japanese and Italian. We came on a Saturday night when the buffet was on. Absolutely delicious. Everything was really tasty and fresh with a big choice. Malinda was our waiter and went out of his way to ensure we had everything that we needed and had a good evening. Well the selection of food was interesting. It's our first time visit here. Enjoyed the dinner. The atmosphere is a pleasant one too. The pizzas and the Lagoon crab curry was delicious. The staff members were very friendly and helpful to mention one including Sidath. Hoping to come back soon. Perfect environment for a family dinner. Glad to have found a new place for dinner at its best. All the very best. keep it up! We were at Flow to celebrate a birthday and the staff went out of their way to accommodate our every wish from allowing us to bring in a home-made cake, to helping us cut and serve it and even packing it up for us to take back! Sadly we didn't get the names of the staff but everyone was always attentive and very obliging! We decided to go à la cart and enjoyed the delicious food ranging from salmon to pork ribs and rack of lamb! Kudos to the Flow team for maintaining your standards, the excellent service and fantastic food! Breakfast buffet at Flow is outstanding!! We stayed at Hilton Colombo Residences multiple times during our recent visit to Sri Lanka and really enjoyed the hospitality of the excellent staff at the hotel. The highlight of our stay was the breakfast buffet at Flow restaurant - Chef Rohan and his team put out an excellent spread and the food and the service was of a very high standard. Michael our server was very attentive and helpful. The lunch time manager Rukmal, and our server Angelo, made our last lunch in Sri Lanka with our family an very enjoyable one. Kudos to your team and we have no hesitation in recommending Flow to anyone. 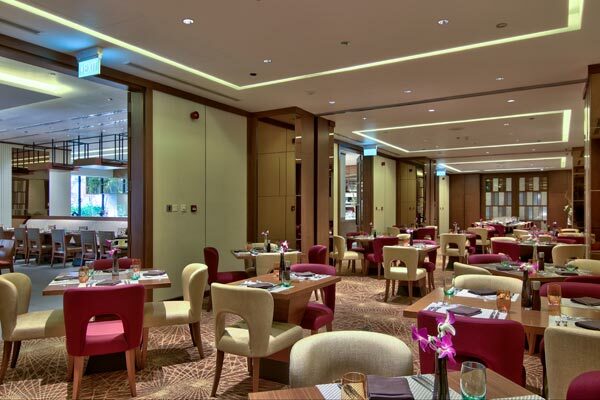 As a multi-cuisine restaurant, FLOW offers Sri Lankan, Indian, Chinese, Japanese and a range of western cuisines, with an à la carte menu that features the signature dishes, as well as an extensive range of premium wines. The 168 seats can be either near the window watching the busy streets of Colombo or be tucked away in one of the three private dining rooms. 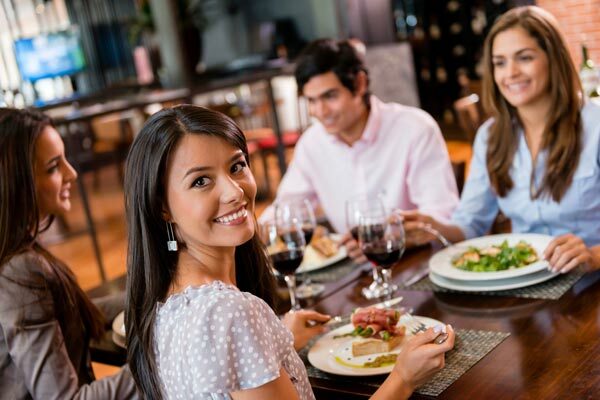 The Private Dining Rooms are ideal for groups of corporate meeting lunch meetings, private dinner parties for family, or simply for a gathering of friends.The Chef’s Table can host up to 14 guests, and the other private dining rooms between 15-20 guests. FLOW’s open kitchens and bright and airy spaces make the restaurant ideal for friends, families, and corporate clients. 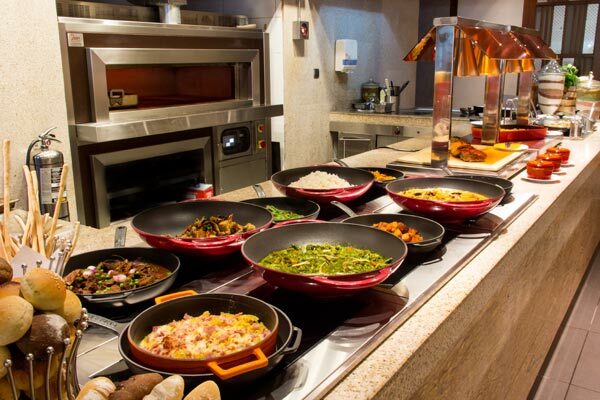 Choose from the Open Kitchens where you can watch the chefs in action in the Indian, Sri Lankan, Western, Chinese, or Japanese kitchens.